Relax on golden beaches, see the Sydney Opera House and explore the Great Barrier Reef on an Australia vacation – without breaking your budget. 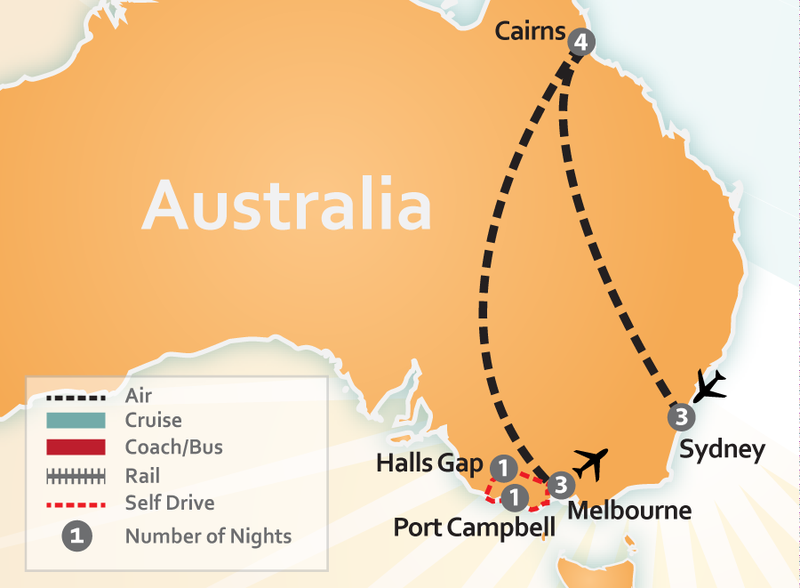 Taking a trip to Australia has never been easier. A vast land almost the same size of the U.S., it has something for every style of traveler. With gorgeous beaches, lush rainforests, inspiring outback landscapes and incredible cities, an Australia vacation is on the bucket list for travelers around the world. 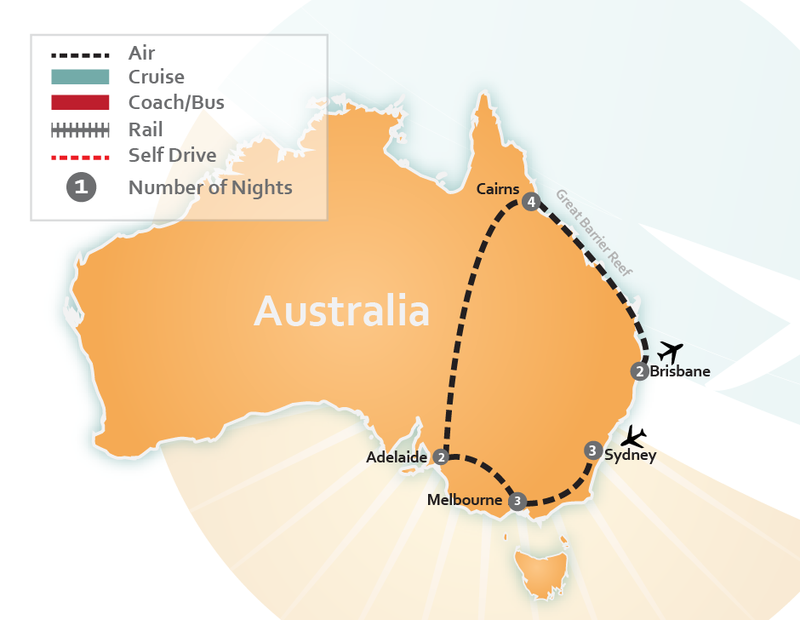 Our Australia vacation deals take you to the best of Australia with your budget in mind. It’s important to remember that Australia is almost the same size of the U.S. Hitting some of Australia’s major hot spots – such as Sydney, Cairns and Melbourne – is like traveling from Miami to New York then Houston. Definitely not something you want to do by car, especially when driving is on the other side of the road! You also want to give yourself enough time in each destination to truly take in the wonders of Australia. You could easily spend a few days exploring just one city. The best time to go on an Australia vacation depends on a few factors. The seasons are opposite to ours in the U.S. Their summer is our winter. You probably won’t be packing a swimsuit for Sydney in July – you’ll be in for a chilly surprise! Australia is full of unique sights, cities and landscapes. No other place is like Australia, where one day you can be swimming in turquoise beaches and then riding camels into the desert sunset the next. There’s always something for everyone to enjoy. Sydney is on almost every traveler’s bucket list. It’s undeniably one of the world’s most gorgeous harbor cities, with sparkling turquoise waters edging lush botanical gardens, vibrant harbor precincts and the iconic Sydney Opera House. Most trips to Australia begin with Sydney, as it’s the perfect combination of everything Australia has to offer: incredible wildlife, fantastic food and wine, thriving arts and music scenes, sun-kissed beaches, and some of the most amazing coffee you’ll ever taste. Tour the Sydney Opera House and catch a show after dining at one of many delightful restaurants along the Sydney Harbour. Test your courage and take in the gorgeous views of the Sydney Harbour on an exciting Bridge Climb. Take a cruise along the harbour and stop at various Sydney landmarks, such as Luna Park, Barangaroo, Taronga Zoo and more. Pick up a surfboard and learn how to surf in Bondi Beach, where golden sands and remarkably blue waters make for a gorgeous beach in the heart of Sydney. If you’re feeling a little restless, the Bondi to Coogee coastal walk takes you along some of Sydney’s best beaches and boasts spectacular coastal views. You won’t be able to resist rolling out your towel on any of Sydney’s beaches. For a day away from the bustling city, head to the Blue Mountains. This breathtaking region, only a short distance away from Sydney is perfect for hiking through bushwalking trails, eucalyptus rainforests, waterfalls and fantastic rock formations. The views you’ll come across are truly out of this world. Indulge in premium wines and gourmet food in the Hunter Valley wine region, the oldest wine region in Australia only about 3 hours away from Sydney. Endless vineyards and boutique wineries dot the serene, green landscape, making you feel an entire world away. Taste the best wines this region has to offer on a fun winery-hopping tour and stop for lunch at one of many fantastic restaurants showcasing the excellent local produce. No trip to Australia is complete without a trip to the Great Barrier Reef. Make your base in Cairns or Port Douglas for an easy gateway to the reef. Located in the tropics, these destinations are all about board shorts, sandals and sun. Get up close and personal with the colorful marine life on a snorkeling tour of the reef. Don’t want to get wet? 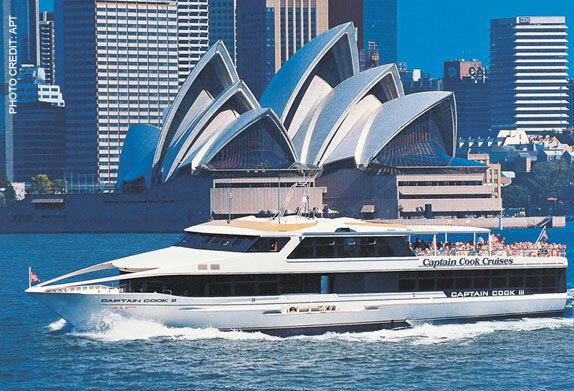 No worries – our Australia vacation packages include cruises complete with glass bottom boats and underwater viewing observatories, so you can enjoy the reef without dipping a single toe in the water. For a unique Great Barrier Reef experience, head to the Whitsundays, right off the coast of Queensland. This is where Aussies (local Australians) go for their beach holidays, and once you step foot here you’ll soon see why. Sail across the Whitsunday Islands and walk on the untouched white sand of Whitehaven Beach – rated as one of the best beaches in the South Pacific. Get closer to Australia’s roots in the Daintree Rainforest in Cairns, the oldest rainforest in the world. Go on an Aboriginal-guided tour of the rainforest and spot cassowaries, crocodiles and other wildlife while learning about the ancient culture of the Aborigines. Australia’s most stylish city has a distinct European feel about it. The city center is a whole hidden world of incredible cafes, bars, restaurants and shops featuring Melbourne’s best local food, coffee and shopping. Take a turn into its central laneways and arcades, narrow passageways decorated with colorful street art and hidden treasures. A walking tour guided by a passionate local is one of the best ways to start your visit to the city. You’ll discover gems that won’t be found in guide books. Art lovers will want to explore the many art galleries, museums and theatres showcasing international masterpieces and unique local art. The thriving arts and music scenes are unrivalled anywhere else in Australia – even Sydney! As the sports capital of Australia, there’s no better place to experience Australia’s love of sports than in Melbourne. Less than 2 hours away from Melbourne is Phillip Island, an Australia must-do. Dotted with nature parks, local restaurants, irresistible beaches and stunning coasts, this is the perfect getaway from the pulse of city life. See koalas in the wild at the Koala Conservation Centre and the world’s tiniest penguins as they waddle across the beach back to their burrows on Phillip Island’s penguin parade. Another iconic Australian experience is the Great Ocean Road, one of the best road trips in the world. Winding along breathtaking coasts, larger-than-life rock formations and amazing lookouts, this is the perfect adventure for travelers looking for the unexpected! This cosmopolitan city is quickly becoming a hot spot for an Australia vacation. Cultured, sophisticated, and filled with a ton of phenomenal places to wine and dine, Adelaide is your spot for Australian cultural delights. Taste your way through the growing local beer scene, explore the burgeoning eateries hidden in laneways and stroll along North Terrace, home to Adelaide’s cultural institutes such as the Art Gallery of South Australia and the South Australian Museum. Enjoy a day of wine tasting in the Barossa Valley, one of the world’s best wine regions. Over 80 cellar doors, gourmet eateries, boutique shopping and small group tours, the Barossa makes for a truly indulgent stay. Just across the water from Adelaide is Kangaroo Island, Australia’s own zoo without fences. Kangaroo Island is famous for its green landscapes, pristine beaches and more kangaroos than humans. Discover the thriving wildlife that roams around the island on guided walks and tours of the island’s landmarks. Hand-feed kangaroos, walk among sea lions, swim with wild dolphins and so much more. If you love wildlife, you won’t want to miss Kangaroo Island. Australia is famous for its gorgeous beaches and tropical lifestyle. You’ll get a taste of this laid-back vibe in Tropical North Queensland, home to Australia’s best collection of beaches, coastal lifestyle and waterfront adventures. When you’re not exploring the underwater wonders of the Great Barrier Reef, head to Gold Coast for sun-kissed beaches backed by glamorous high-rises, barreling waves and subtropical hinterland. Rejuvenate in Sunshine Coast, where the beaches tempt even local Aussies with their sparkling turquoise waters, impressive waves and quiet beach towns. Noosa, a gem of Sunshine Coast, is popular with the locals for its dynamic national park, walking trails, markets and festivals. Spot humpback whales as they migrate through the waters of Hervey Bay, just across Fraser Island. As the only place in the world where rainforest grows on sand, this island is best explored on an 4WD adventure. Thrill seekers will want to join a 4WD tour across Fraser Island and explore its crystal clear creeks and the white sands of Lake McKenzie. Touch up your tan and take out your bikini – this will be your new happy place. You haven’t truly seen Australia if you haven’t traveled to the Outback. Made famous as the setting of Crocodile Dundee, this region is more than just desert and crocodiles. Located in Australia’s Northern Territory, this vast region encapsulates a whole world of spiritual landmarks, otherworldly landscapes, vibrant cities and cultural experiences. 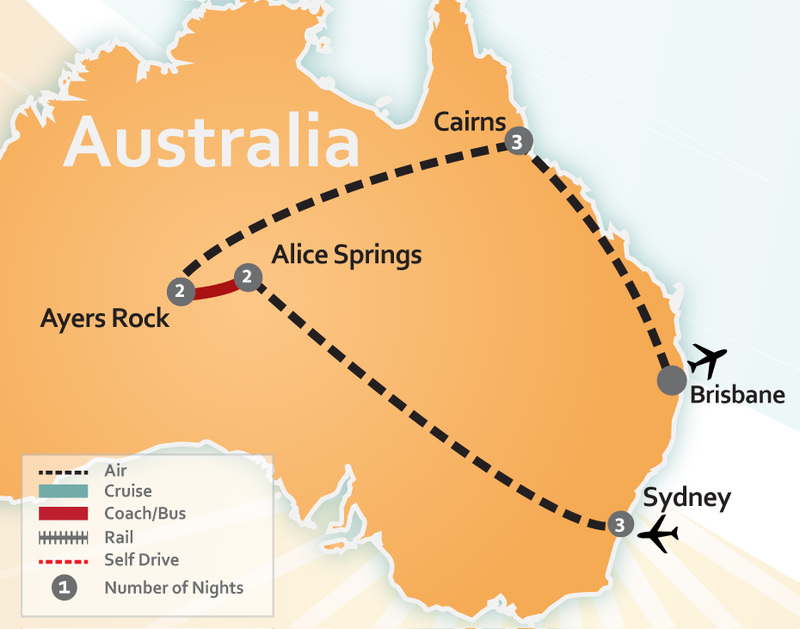 Visit Alice Springs, the heart of the Outback, and see the sun rise above Uluru (Ayers Rock) and watch the glow of dazzling red hues change across this sacred rock formation. Learn about Australia’s ancient Aboriginal culture and its deep ties to the mystical red desert of the Northern Territory. Explore the tumbling waterfalls, lush gorges and sheer orange cliffs of Kakadu National Park, the largest national park in Australia. 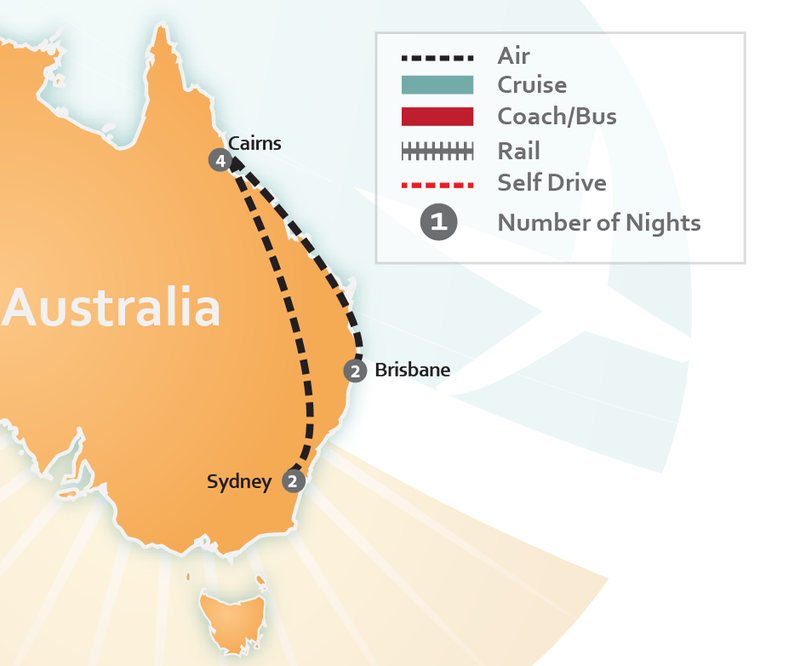 Travel the Outback in style on one of Australia’s great rail journeys – the Ghan. 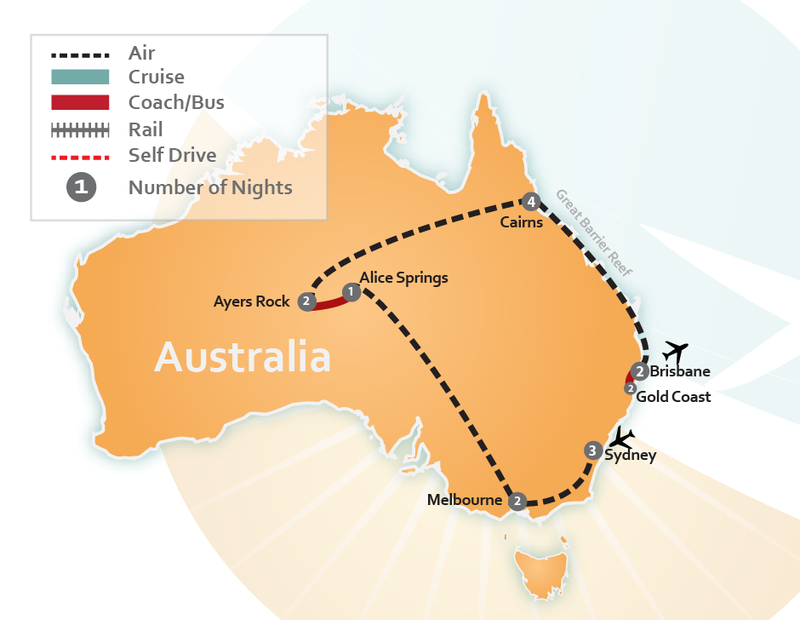 With stops offering tours of authentic Outback destinations, you’ll experience the romance of train travel paired with rugged adventures – the perfect Australia vacation experience. Nature lovers and outdoor adventurers need to have Tasmania on their list. Teeming with unique wildlife, rugged coasts, wilderness regions and spectacular mountains, this island state feels like an entirely different world to mainland Australia. Make its gorgeous capital city, Hobart, your base for exploring all Tasmania has to offer. Visit the provocative Museum of Old and New Art and taste some of the freshest seafood in vibrant waterfront restaurants. Delve into Australia’s convict history in Port Arthur and explore the historic buildings haunted with a harsh past. Wander to Freycinet National Park for stunning blue bays, pink granite mountains, rich coastal forests and pure white sand beaches. And of course, no stay in Tasmania is complete without meeting the famous Tasmanian Devil! We’re Aussies living in Texas (USA). Planning trips to Australia from the USA is our passion. From our sale of Australia travel packages we contribute to many local communities, both here in the USA and at home throughout the South Pacific. We feel great about what we do, and we love to receive feedback that our clients had the “trip of a life-time” – take a look at our reviews! To help inspire you to travel to Australia for your next vacation, browse our Australia Vacation Deals below. We also plan escorted Australia tours and inclusive packages that take care of everything you need for your trip Down Under. Remember, all our trips to Australia can be tailored into custom travel packages to suit your interests. 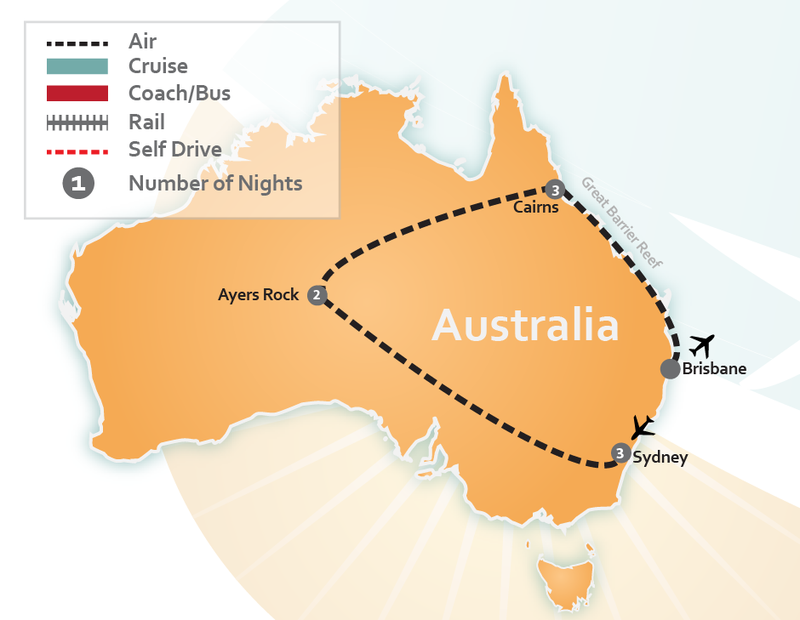 We’d love to help you plan your vacation to Australia. Call Us Today for a Free Australia Vacation Quote!